When you can squeeze a half dozen towering waterfalls into one photo you are in a pretty special place, and Norway was that place. This gallery is our Princess Cruise in June 2012 and covers all our Norwegian ports of call except the Lofoten Islands and England, which are both in separate galleries. Lots of mountains, deep fjords and remarkable towns. The cruise started and ended in Southhampton, England. Images are a lot sharper and bigger in SLIDESHOW, an option in the upper right of this page that I recommend. The captions say a lot about what you are viewing and will show up in slideshow as well. You can also skip images and control the speed of image changes. 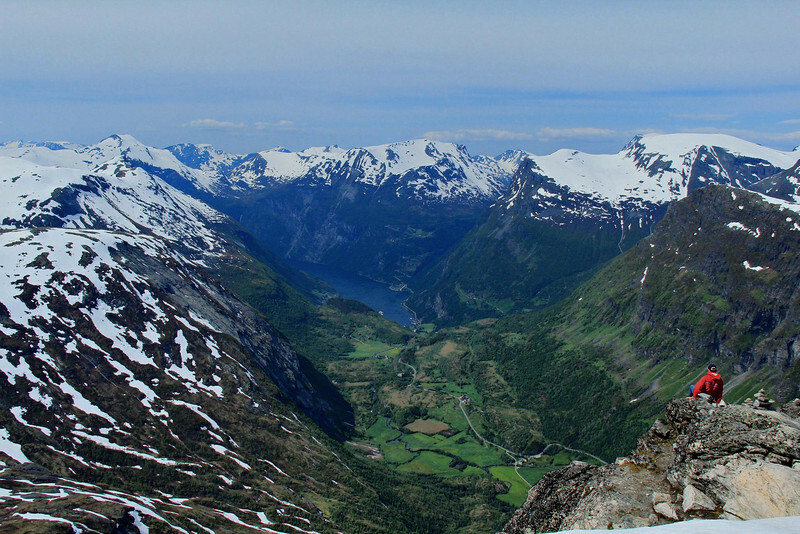 Geirangerfjord as seen from the top of Mt. Dalsnibba, over 4800 feet above the fjord. Weather was ordered up to perfection, and the solo stranger wearing the red jacket is straight out of the landscape photography instructional books.